Some of them had been in there for months! The slow lorises had spent weeks crammed in tiny crates with just enough food and water to keep them alive — and they were petrified. Two men had captured 79 of these tiny primates from the forest in West Java, Indonesia, and planned to send them to China, where they’d be sold as pets — but thankfully, that didn’t happen. When neighbors figured out what was going on, they alerted police. 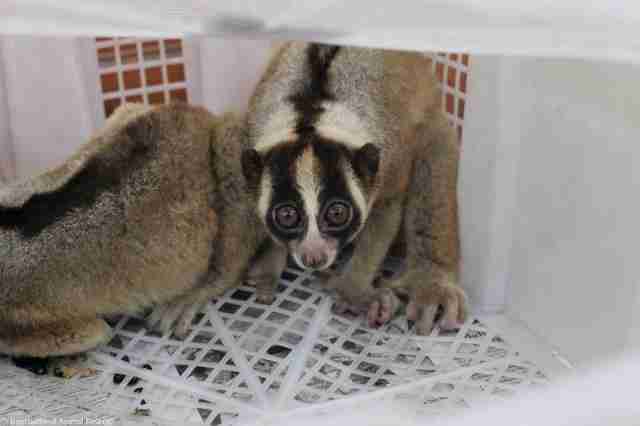 The police got in touch with officials from the West Java Regional Office of the Forestry Department (BKSDA) and International Animal Rescue (IAR), and a team hurried to rescue the slow lorises — and to arrest the men who caught them. 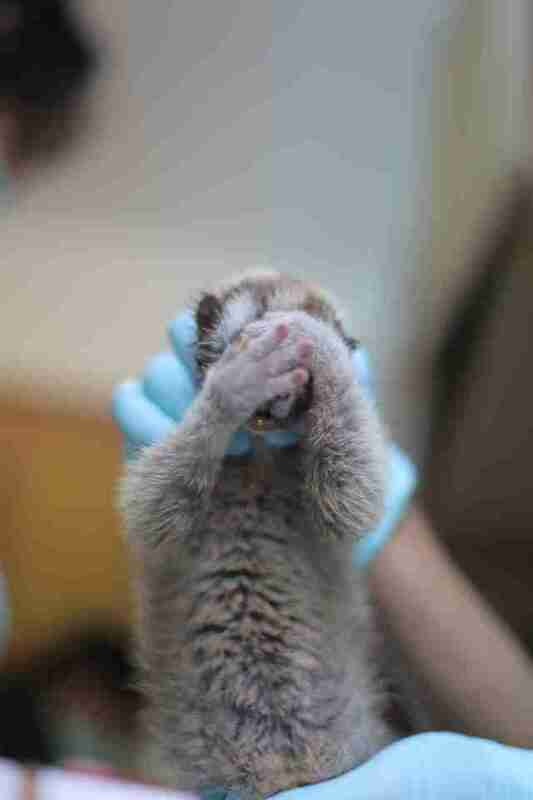 The slow lorises were in horrible shape. Many of the slow lorises had bite marks and other wounds on their bodies, which they’d probably inflicted upon each other due to the stress of captivity. 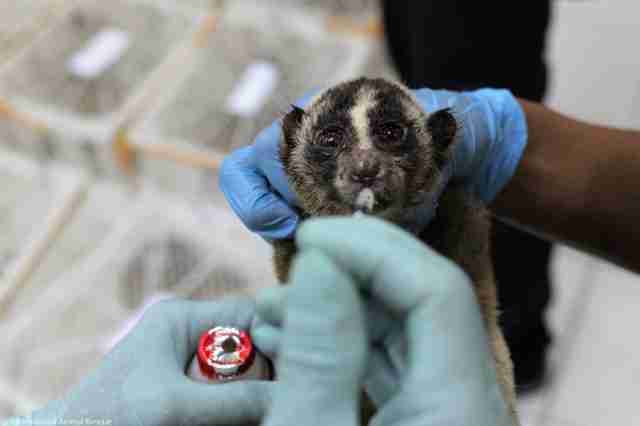 One slow loris even had a BB gun pellet lodged in his face. Sadly, it was too late for some of the slow lorises — and it’s possible that others had died and been discarded before help arrived, Key explained. But the rescue team is doing everything it can to help the survivors. When slow lorises are destined for the pet trade, it’s common for traffickers to clip or completely cut out their teeth — a painful procedure usually done without any kind of anesthetic — so the animals are easier to handle and can’t fight back against people handling them. 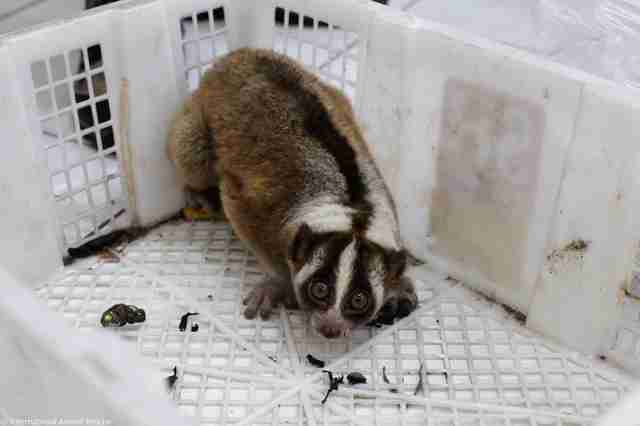 Fortunately, these slow lorises still had their teeth intact, which will enable them to be returned to the wild. Key and the rest of the IAR team are also pleased by how everyone worked together to save the slow lorises and to catch their traffickers. To help the surviving slow lorises return to the forest as soon as possible, you can make a donation to IAR.